You are the proud owner of an expansive collection of the most rare and exclusive hypercars, but didn’t put your name on the list for a Koenigsegg Regera. The car got sold out and now you regret not getting this technological tour de force. Well, there’s still a chance to reverse your oversight, all thanks to someone who has probably succumbed to the long waiting period of the hypercar. The build slot is available with Classic Motor Cars for an undisclosed amount. The Regera was launched for an asking price of $2.1 million. Some time ago, Dubai-based supercar dealer Knight International was asking $2.65 million for a build slot so expect to pay a similar premium for this allocation. 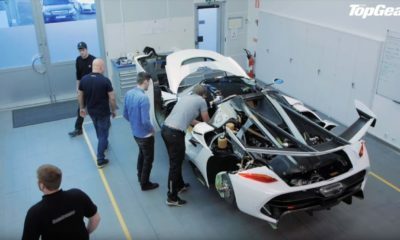 The Regera has been designed as a luxury hypercar, which is in contrast to the traditional extreme, light weight, race-like road cars the Swedish automaker has been building for all its history. The Regera combines a powerful twin-turbo V8 combustion engine with three electric motors and cutting edge battery power via new powertrain technology called Koenigsegg Direct Drive. The KDD does away with the traditional gearbox, making the car lighter, more efficient and quicker. The clever technology will allow the Regera to do 249 mph (400 km/h) in less than 20 seconds, faster than any other production car in existence. All this makes the Regera a unique machine, worthy of a place in the most ardent car collections of the world.